Two different instruments can be made to play automatic arpeggios along with the rhythm unit, based on what you play on the lower-manual, with two different speeds and patterns. And there's volume, instrument balance, and tempo controls for the rhythm unit. The balance allows you to control the volume of some of the percussive instruments against the others. 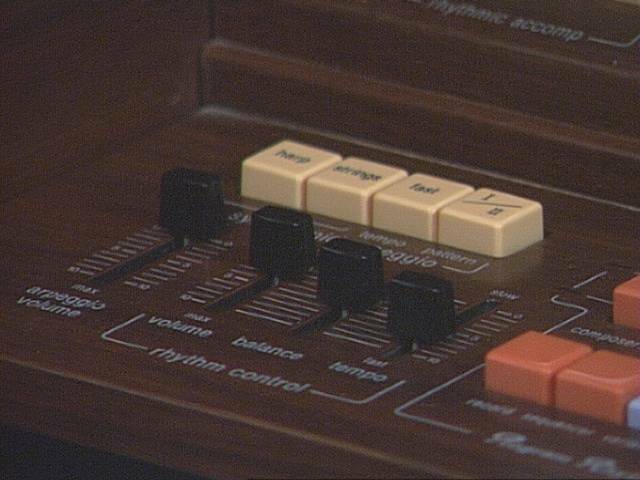 Oddly enough, when pushed up it boosts the instruments shown on the bottom row of the rhythm selector buttons, and vice versa. I found that so annoying that I rewired it to be more logical. That's the only modification I've done to the organ, other than inserting padding between all the panels so they don't vibrate against each other. I've never done anything about the other strange thing about this organ's level controls—contrary to every other device that I've seen using sliding controls, you push these sliders up to turn the level down—as it wouldn't make sense considering the way the controls are labelled.